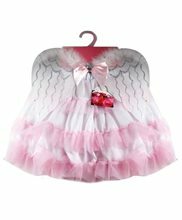 Devil Angel Child Costume.Includes: Half Red and Half White Dress, Matching Red Tail, Headband with One Horn, One Halo and Half Red and Half White Wings.Available Size: Girls - Small (4-6), Girls - Medium (8-10), Girls - Large (12-14). *Shoes Not Included.There's two sides to this little sweetie. Will she choose her angelic side or her devilish ways? You won't have to pick sides in this velvet dress that's half trouble, half angel costume. Naughty and Nice Devil Angel Costume includes dress, wings and headpiece. You'll shock all your friends this Halloween! 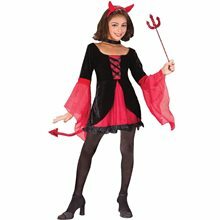 Dazzling Devil Child Costume.Includes: Dress with ruffle trim, Bell sleeves, Tail and Headband.Available Size: Child - Small (4-6), Child - Medium (8-10), Child - Large (12-14). (See Size Chart For More Information)*Pitchfork, Choker, Stockings and Shoes Not Included.This Girls Dazzling Devil Costume includes dress with ruffle trim, bell sleeves, tail, and headband. Add a pitchfork and you are ready for a devilish Halloween eve. Choker, stockings and shoes not included. Comes in 3 sizes. 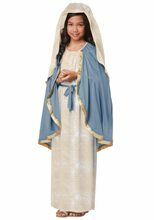 Biblical Times Mary Child Costume.Includes: Dress, veil headpiece and rope belt. Available Size: Child - Medium, Child - Large. (See Size Chart For More Information) Material: 100% Polyester. *Sandals Not Included. Accessories Sold Separately. Biblical Times Mary child costume Features dress, veil headpiece and rope belt. Sandals sold separately.